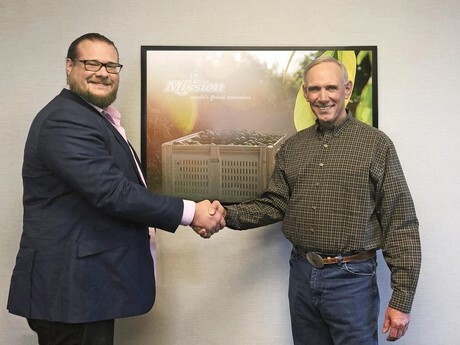 After over a year of testing post-harvest solutions, Mission Produce, Inc. and Hazel Technologies, Inc. announced a partnership to extend the shelf-life of avocados. As part of the collaboration, Mission Produce will continue to test (with the aim to integrate) Hazel Technologies' USDA-funded packaging solution across its global supply chain with the aim of reducing waste and shrinkage. Hazel's Aidan Mouat (left) with Mission Produce CEO Steve Barnard. For many years, Mission Produce shared it actively researched several new post-harvest shelf-life extension solutions. According to Patrick Cortes, senior director of business development, “We decided to collaborate with Hazel Technologies because in our initial year of testing, the company’s solutions proved to increase the shelf-life of both hard and ripe avocados, maintain and extend the internal quality of the fruit, and minimize the operational impact to the supply chain. However, the main benefit of the partnership is working together to reduce global food waste.” Mission Produce also wants to reduce customer throwaways, in turn increasing profits, while creating more positive consumer experiences that ultimately drive category growth. 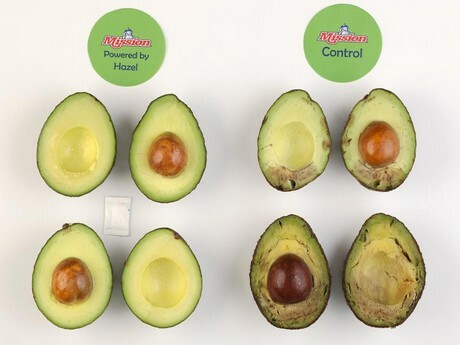 After over a year of research and trials with Hazel Technologies' packaging inserts, Mission Produce observed it saw an increase in the shelf-life of both hard and ripe avocados when including the new technology. In several different settings, Mission Produce conducted studies using Hazel® 1-MCP technology and the results were consistent: the avocados experienced an extended shelf-life and internal quality, they said. The technology, which is funded by the United States Department of Agriculture (USDA), is a quarter-sized biodegradable and food-safe packaging insert that is placed in the box. “Our premier technology effectively reduces waste and shrink in an easy-to-integrate fashion. Because of the packet’s ease of use, there is little impact to the efficiency of the supply chain,” added Mouat. According to Hazel, the packet can be applied in various environments such as at source, during packaging, or at Mission Produce’s distribution centers. Both companies said this provides solutions in many aspects; shelf-life extension, ease of application, limited supply chain disruption and an improved customer experience.